According to Thai dictionaries, there are 48 Thai consonants representing 21 distinct initial consonant sounds and 9 distinct final consonant sounds. The order of the consonants below is arranged by the Thai dictionary order. We romanized the characters and grouped them mostly based on the sounds in English and the International Phonetic Alphabet (IPA) system. Therefore, it is easy for foreigners to learn and understand how each consonant is pronounced from the romanization below especially if you know some IPA. When we use the romanization below to transliterate Thai words or sentences, everybody will read it correctly in the same way as Thais. For example, “Thai language” (ภาษาไทย) can be transliterated as [phaasaathai]. Upper roman scripts with white background represent initial sounds while lower roman scripts with grey background represent final sounds. ” = The consonant can be considered as a vowel. * = The consonant comes with its own vowel. 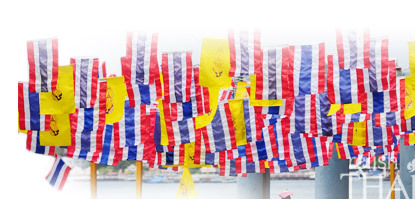 National flag of Thailand is also called TRAIRONG flag (ธงไตรรงค์) which means three-colored flag; red, white, and blue. The meanings of the color are red for nation, white for religious, and blue for the king. Thai’s national flag shows five horizontal stripes in the colors; red, white, blue (double width), white and red. Please see how to draw the flag of Thailand below. How to draw Thai’s national flag. 1. Thai’s national flag is rectangular and the ratio of the flag is 2 to 3 (height, width). Here we have 3 cm. for the height and 4.5 cm for the width. 2. Divide the height into three so we have three horizontal stripes. The height of each stripe is one centimeter. 3. Fill the center stripe with blue color. Then, divide the upper horizontal stripe into two stripes equally and do the same with the lower horizontal stripe. 4. Fill the top stripe with red and do the same with the bottom stripe. Here you go! Below is the clip of the Thai national anthem on Youtube.com. Let’s sing along!